In preparation of a new research cycle that will begin next Autumn, starting with Station (1)0, this Summer the Laboratoire espace cerveau will present a review of the different research done between 2009 and 2014. Being units dedicated to exploration, the stations of the Laboratoire espace cerveau are made up of study days concerned with are the study of artworks, whether they unfold in situ, or ex situ, as with the Centre Pompidou-Metz in 2012..
From its very origins, the laboratory has based its work upon space itself, on the one hand as a possible vector of artistic fact, on the other hand as an extension of the eye, the brain and the body, out as far as the cosmos. How to deal with a world wherein our understanding of space has shifted, beginning with the advent of general relativity and, more recently, quantum physics, from a euclidian vision to a space as yet undefined? 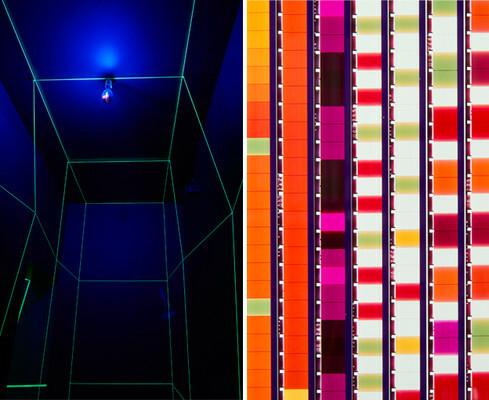 The Laboratoire thus proposes to bring together different research work, from the phenomenological dimension of specific artistic propositions..
Veronica Janssens, spaces of immersive lights capable of provoking a global physical experience such as an experience of the infinite that can be “touched”. As for Matt Mullican, it is through the practise of hypnosis that he approaches the cosmic dimension of the environment, which then drives him to create his own cosmology. Starting from the field of art, the different contributions of these nine stations have examined the mechanisms of perception, whether it be a matter of spatialisation, loss of bearings or modified states of consciousness. Reinforced by recent progress made in the fields of neuroscience and astrophysics, along with developments in anthropological and philosophical thinking, they have dealt notably with notions of the body in action, proprioception, topo-kinesthetics, and empathy. With works by Gianni Colombo and Paul Sharits, the Laboratoire revisits “in practice” questions raised throughout the different stations. Gianni Colombo creates spaces that aim to deconstruct space, by disturbing the visitor’s centre of gravity, and also by unbalancing it with the help of luminous and mobile devices and systems. Reinforcing corporeal acuity, the variations and elasticity of Colombo’s universe create the impression of an expanding space. The films of Paul Sharits, like events composed of colourful lights, amplify pure visual effects to the point of creating immersive environments. The impact on the retina of a succession of stills creates a pulsating virtual volume. This “extanded cinema” substitutes the sensorial presence of the projection for the illusion of the image. astrophysics, astrobiology, anthropology… crossing them with that of artists, today questioning notions of the man-world, of the body extended to the scale of the universe.